Home > G-sleeve Art > "Winter Council"
This is a print of David's "Winter Council" which won first place in a recent art show. 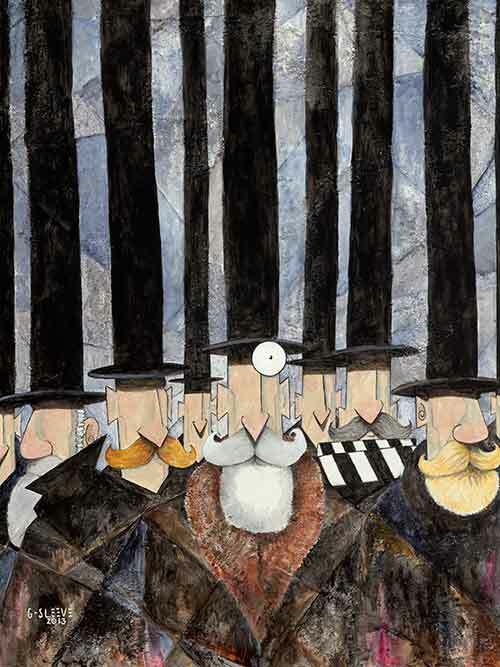 It is a bold portrait of his gentlemen in winter attire, sporting their signature top hats. From the central character with his distinctive monocle to his compatriots with their assortment of mustaches and beards, these are certainly very merry gentlemen. Hang it in your home and you will get numerous comments and compliments. David is widely recognized for his assortment of paintings and prints centered on the antics of his "Top Hat" characters. This is a diverse collection of curious fellows of all stripes. He has sold more art from this collection than any other of his works and he continues to "invent" new situations for them to appear in (have done many commissions for original art to meet customers specifications).